Welcome to Dahab Hostel in Cairo... - The best deal in town! Cheap Hostel Hotel centrally located in Downtown Cairo! Book your room Now! Thanks for visiting Dahab hostel's official website, winner of the TripAdvisor's certificate of excellence 5 years on a row. Dahab hostel is the best deal in Cairo, It's great! It's cheap! It's centrally located! It has a special charm located on the rooftop of a Downtown colonial building. Are you planning to visit Cairo? Are you traveling on a budget and you need a great place to stay? Do you want to live right in the center of city? Do you need an ideal place to relax after a long day in the noisy big city? The answer is simple, Dahab hostel is the perfect place for you! 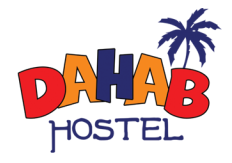 Dahab hostel is one of the most popular hostels in Downtown Cairo, it provides quality together with cheap, affordable accommodation. Our website is designed specially to give you information about our hostel, tourism in Egypt, help you throughout your trip to Cairo and help you to book your room online to save time and effort.